There are lots of reasons to want to meet a bookshop – the need for a book, location, looking for a friendly chat, a recommendation... I'm not going to try to list them all here, but my reason for wanting to visit my next destination was Twitter. One of the (admittedly many) places that had inspired me to write this blog, Kirkdale Bookshop is simply a very entertaining read on the social media site, which is why I was very excited when I realised I could make it the second stop on my 2014 Books are my bag bookshop crawl. After all, I wanted to find out if the bookshop was as great a character as its Twitter presence. 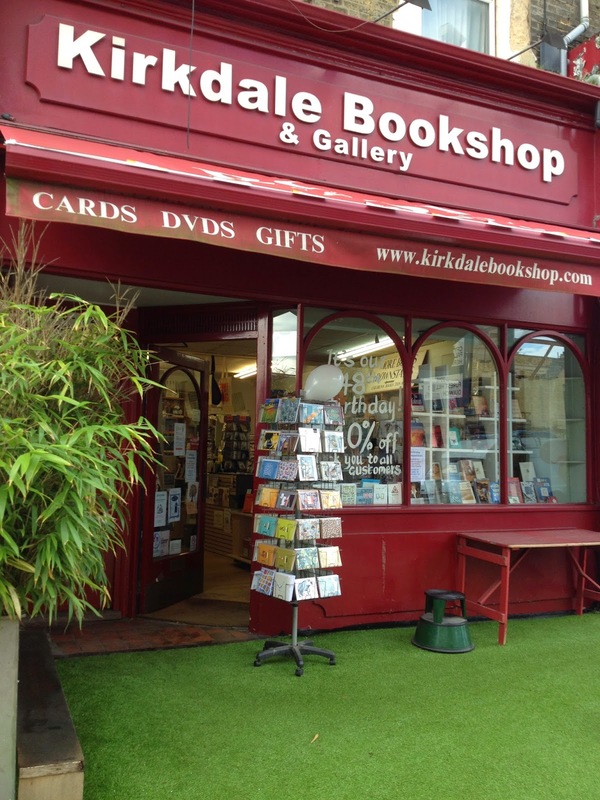 Walking up the road from a bus stop in Sydenham, Kirkdale Bookshop was hard to miss as its warm red front and lush green 'grass' brightened up a grey London street. Throw in orange and white balloons and a window celebrating its 48th birthday and I imagine all passers-by must be encouraged to smile (and pop in instead of passing by). 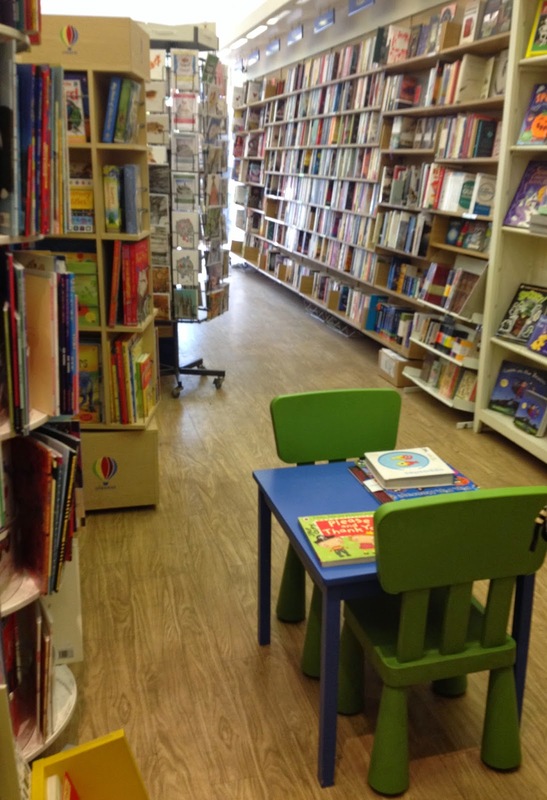 Stepping inside, the initial feeling is of entering a bright and cosy boutique bookshop, but passing beyond the central till and large selection of new books you discover an equally welcoming children's section and stairs leading down to the secondhand section. 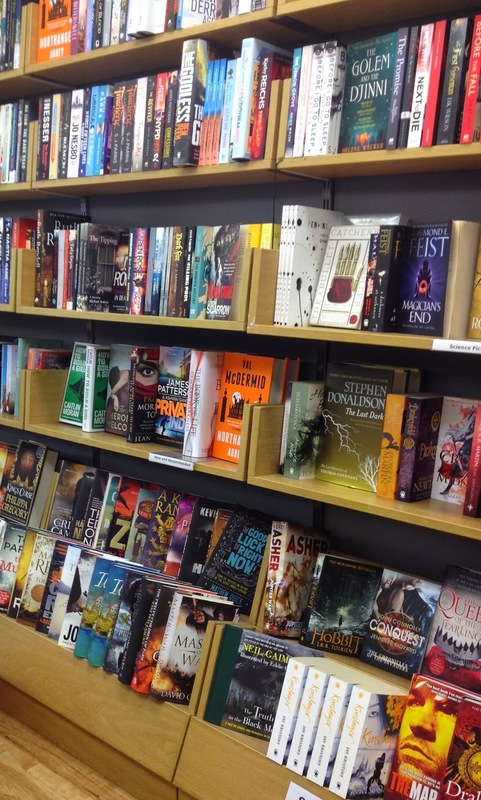 There's a lot more to this bookshop than you'd first expect. My arrival coincided with children's story time and it was hard not to stop and make the most of the opportunity of being read to in such a bright and welcoming bookshop. However, time was not on my side and so instead I (only semi-reluctantly) made my way downstairs to the secondhand area. Still a spacious place to explore, this section contrasts nicely with the new books upstairs as browsers are invited to wander through a small maze of tall bookshelves. Hours could easily be lost here but I was on a mission: I wanted to meet the bookshop Twitterer. Breaking the ice with the request of a book recommendation and pointing to a title I've often wondered about reading, I got into discussion with a friendly bookseller who talked me through the book I'd named (I'll save that title for another time) and made some more appropriate suggestions. More conversation ensued, followed by a chat with the bookshop's Twitter king during which I had to stop myself from sounding like a crazy bookshop groupie and just repeating 'you're great/funny/highly entertaining'. Retreating with my craziness and some helpful directions to my next bus, I eventually left, clutching the bookseller's recommendation of Cold Comfort Farm by Stella Gibbons (which I'd purchased at 10 per cent off thanks to their birthday celebrations). 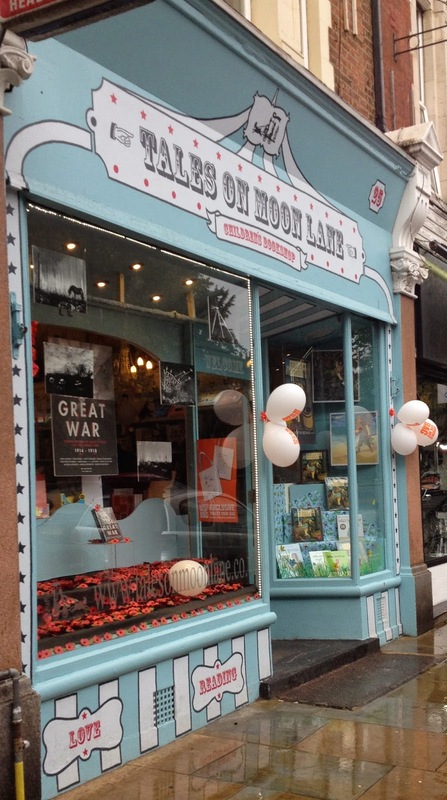 With a reading group, events, gallery space, lots of lovely books and a cheery and welcoming atmosphere, it's easy to see how Kirkdale Bookshop has successfully reached its 48th birthday. It may only be a part of my Twitter community, but in the real world the bookshop is very much a part of the local community. Which is exactly where it should be. On Thursday, 9th October, I was invited to a party. And not just any party. 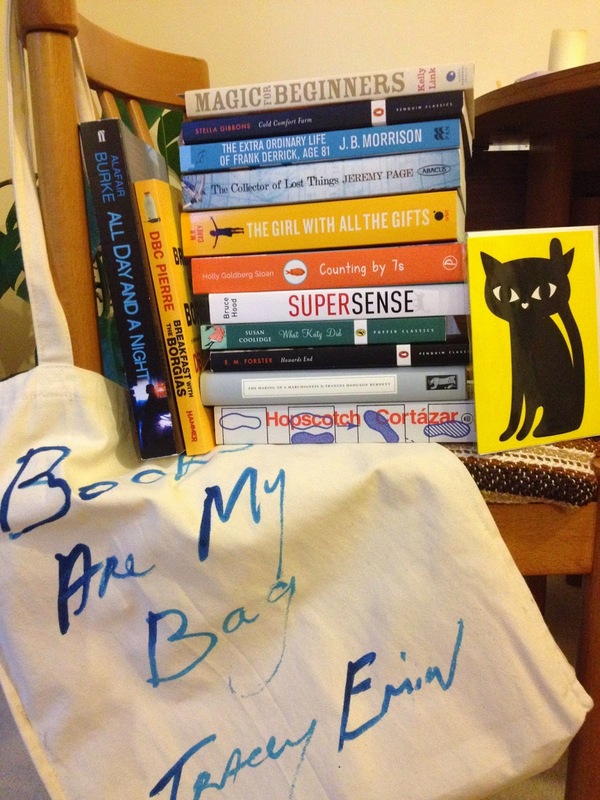 It was the launch night of the second annual Books are my bag campaign. All the way there I was excited, skipping my way through the tube and along the road to the venue (Foyles) and generally smiling at passers-by as I looked forward to the evening ahead. Then I walked in, late, and was confronted by a room full of groups of people I didn't know. Speeches were going on, which gave me time to catch my breath from all the skipping but also to become increasingly nervous as I stood at the back cursing myself for coming to an event where I knew absolutely no one, not even the person who'd invited me. I realised I had two options. I could stay where I was and try to look inconspicuous (I was wearing a bright red dress in a room full of dark clothing) or I could dive in and randomly start talking at people. I chose the second option. It could have all gone horribly wrong. Fortunately the first two people I approached turned out to be the ladies from Beckenham Bookshop, and they were lovely. Their friendliness put me at ease and helped set me on the path to meeting lots more interesting, booky people and enjoying what turned out to be a truly great party. Which is why, a few days later, I made their 'home' the first stop on my Books are my bag bookshop crawl. Arriving at the bookshop I was greeted like an old friend, with the conversation resuming where we'd left off, returning to the party and covering theirs and numerous other bookshops. I couldn't have chosen a better place to start my day. After we'd caught up and swapped stories I set about exploring the bookshop, with my only regret about my visit being that I was unable to stay for the rest of the day. 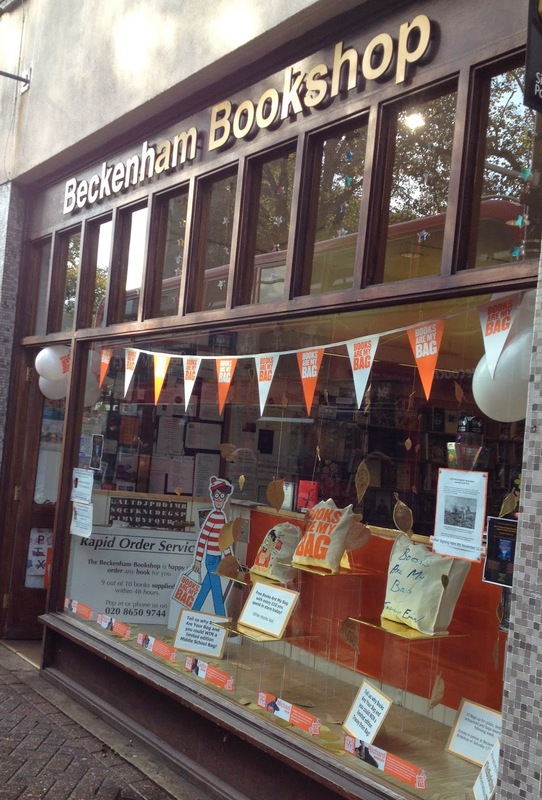 Beckhenam Bookshop is surprisingly large for an indie, but also bright and airy, even when at the very back. Well stocked with all the fiction and non-fiction genres you could ask for, I often found myself stopping to enjoy what I like to think of as 'special' books because they're great gifts but deserve more attention than being lost on your coffee table. And yes, I did fall for Much Loved (hint to any family members reading). However, I couldn't afford the weight of carrying a large book around for a day-long bookshop crawl, so I left the beautiful book behind and instead asked for a light recommendation - something to balance the heavy reads I've recently been selecting. The answer? 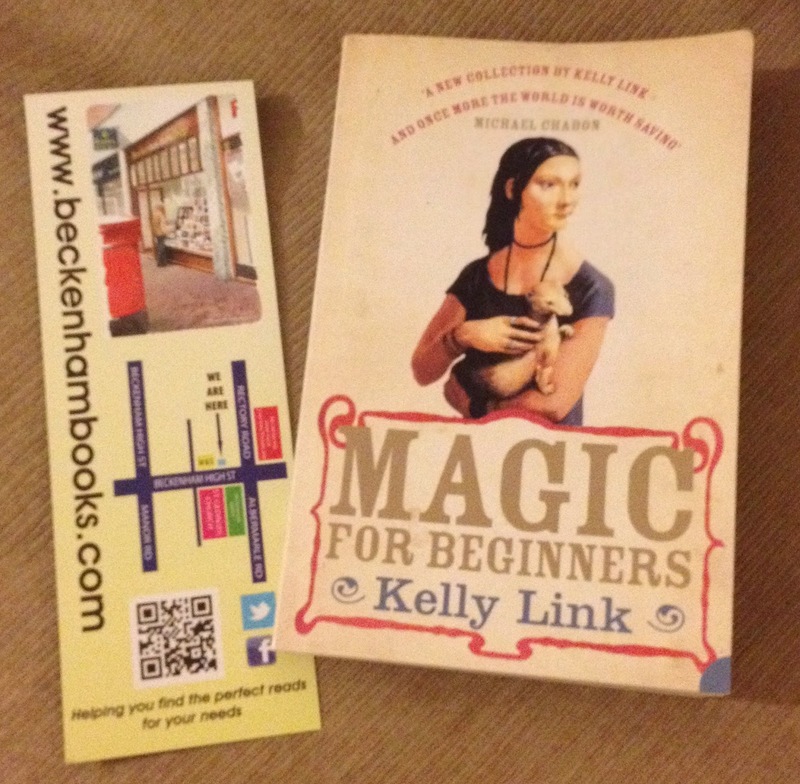 Magic for Beginners, a short story collection by Kelly Link. Not only was I fascinated by the recommendation, I was also kicking myself for having not thought of short stories before. Book in bag, it was time to depart. But not before the ladies had kindly helped me to work out the route for the beginning of my bookshop crawl and shared the secret of navigating London buses. It was their support at the start that helped to make my day the success it became. Indeed so helpful and friendly had they been that I was sorry to say goodbye, my consolation being that - like all good friends - I know I'll see them again. I have a rule that – unless there's a very good reason – I will only write about a bookshop I've a) visited and b) spent money in. Which is why in this week's post I'm only going to tell you about 12 of the 15 bookshops I visited for the second annual Books are my bag day of bookshop parties. Why? Because the best way to support a bookshop is to experience it first hand and spend money it. After all, how could I expect any of you to be encouraged to visit and enjoy bookshops if I wasn't prepared to do so myself? But what is Books are my bag? 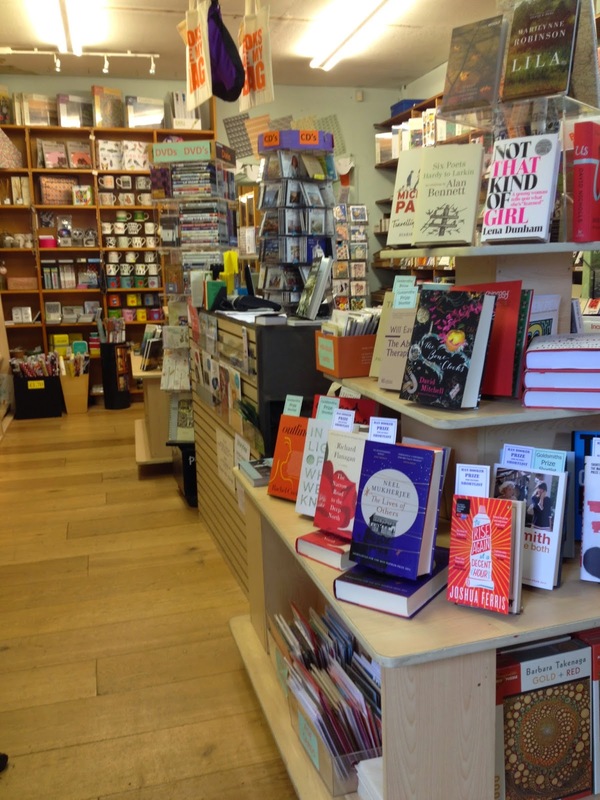 In case you missed last year's post it's a campaign to get people off the internet and back into bookshops – to remind us of the joy of real-world bookshopping, of meeting booksellers and readers and stepping through the door of a bookshop and meeting a read you wouldn't ordinarily encounter. My first stop was Beckenham Bookshop in (depending on personal preference) north Kent/south London. Having met the women from this shop at the Books are my bag launch party two days before I was welcomed like an old friend, giving me a hint of the experience regular customers must experience every time they visit. Our conversation was completed with the recommendation of short story collection Magic for beginners by Kelly Link and instructions for easy navigation of the south London buses... my bookshop crawl had begun. Kirkdale Bookshop in Sydenham came next. A combination of new and secondhand books, I arrived part way through children's story time and would happily have sat down and listened where I not pushed for time. 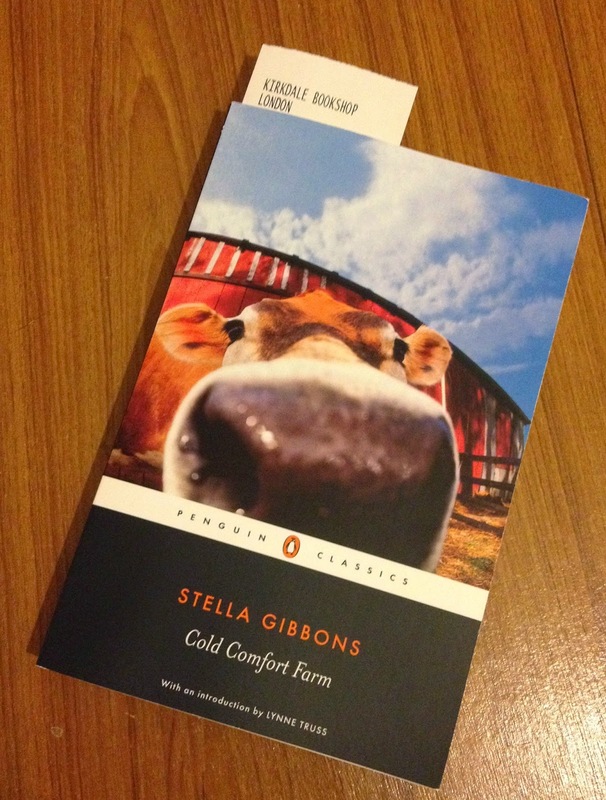 Instead, as the bookshop was also celebrating its 48th birthday I was able to enjoy 10 per cent off my purchase of Stella Gibbons' Cold Comfort Farm. A book I've often wondered about but never read, I was pleased to have it recommended when I asked for something to balance the heavy doorstops I've been reading recently. Double checking my bus route I set out for number three. 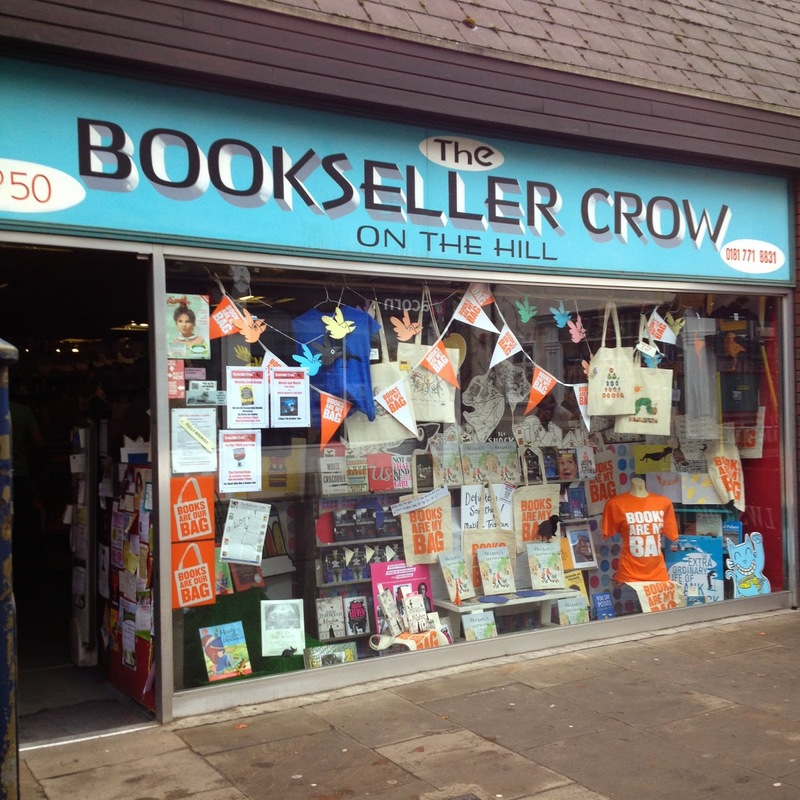 Crystal Palace's The Bookseller Crow on the Hill is somewhere I've always wondered about but been – I'm ashamed to admit – a little scared to visit. I'll explain why when I write in more detail, but needless to say there was nothing to be scared of, other than wanting to spend too much money on books... In the recommends section I picked up The extra ordinary life of Frank Derrick, age 81, by J B Morrison. I know you shouldn't judge a book by its name, but what a great name. 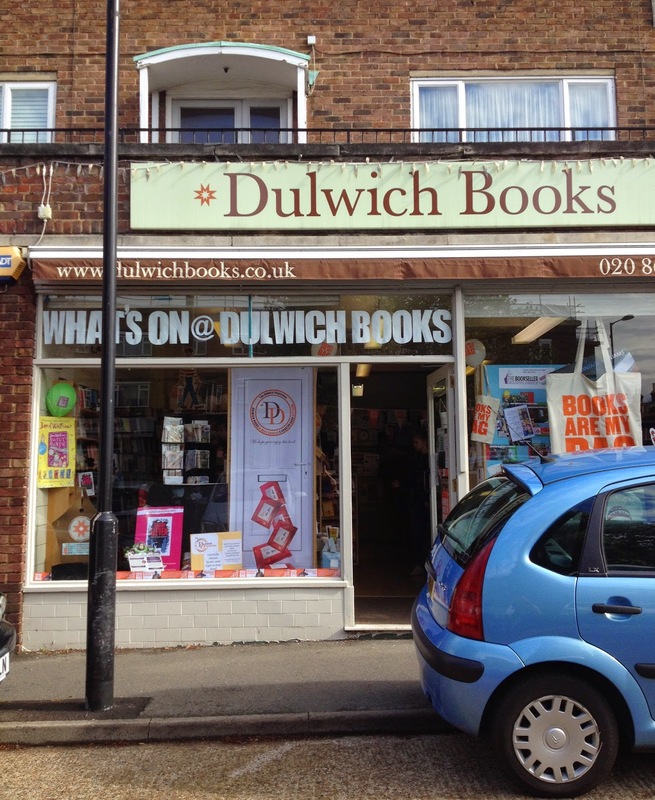 Hopping on another bus I made my way to Dulwich Books. Frustratingly my poor time management meant I arrived minutes after a child-focused Roald Dahl bookshop party had ended, and two hours before the author Jeremy Page introduced his book The collector of lost things. On the plus side I still got to buy the book and I met another friendly bookshop which, in honour of the day, also gave me a limited edition Tracy Emin-designed Books are my bag tote and two free books. Lovely. 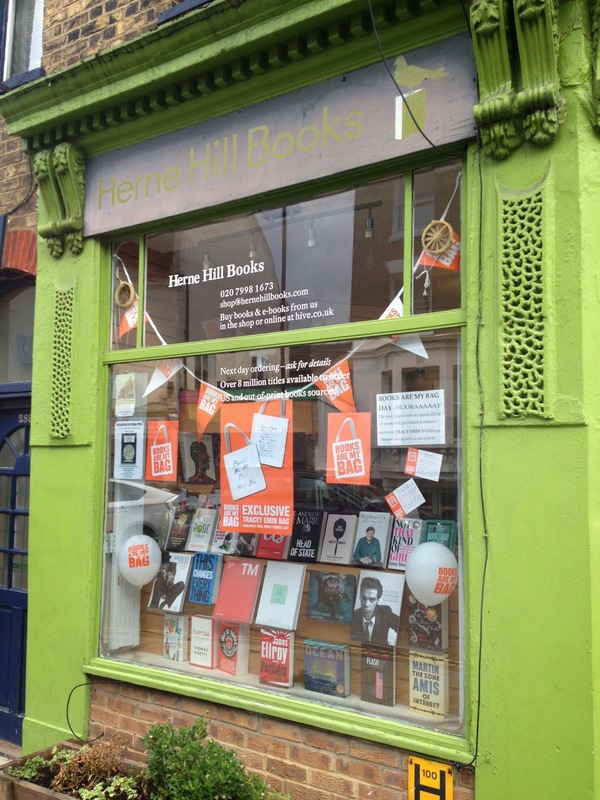 Five and six on my list were both in Herne Hill - the tiny but delightful Herne Hill Books and the beautiful children's bookshop Tales on Moon Lane. The first would fit into my living room three times and still leave space for more but still had as many customers as I've seen in much larger bookshops, here I picked up the rather scary-looking The girl with all the gifts by M R Carey. At the other end of the fiction spectrum, a chat with a bookseller at the children's bookshop soon had me eager to read my next purchase of Counting by 7s by Holly Goldberg Sloan. It was here that I also met another bookshop crawler, @Yayeahyeah, a YA fiction blogger. 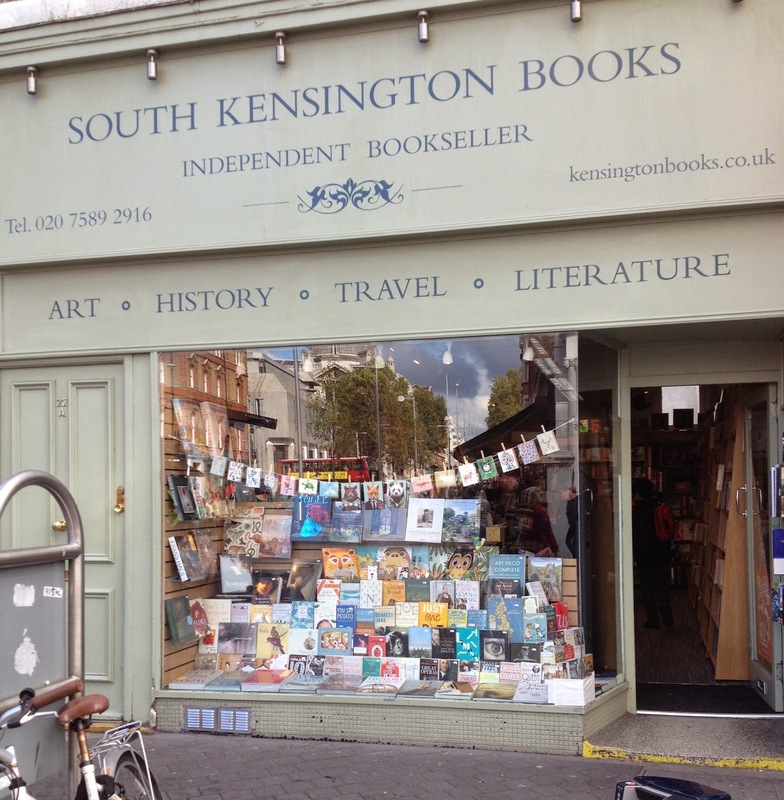 Switching to the underground to travel into town, my seventh bookshop was the discount destination of South Kensington Books. Having walked along its home street many times when visiting the Natural History Museum (a favourite haunt of mine) I couldn't quite believe I'd not visited this destination before, especially when I saw how far back the shop stretches and how cheap much of its stock is. I happily picked up SuperSense by Bruce Hood to satisfy my non-fiction cravings. John Sandoe [Books] Ltd, was somewhere I'd been unable to decide about visiting, meaning I'm very grateful for the recommendation (and directions) that set me on my way. Located just off a very busy main road you enter the bookshop and step back in time. In this classic bookshop I bought a classic - Howards End by E M Forster. I want to say more but for now I'll just tell you it was wonderful – find out more in a couple of weeks. Number ten was another old favourite. 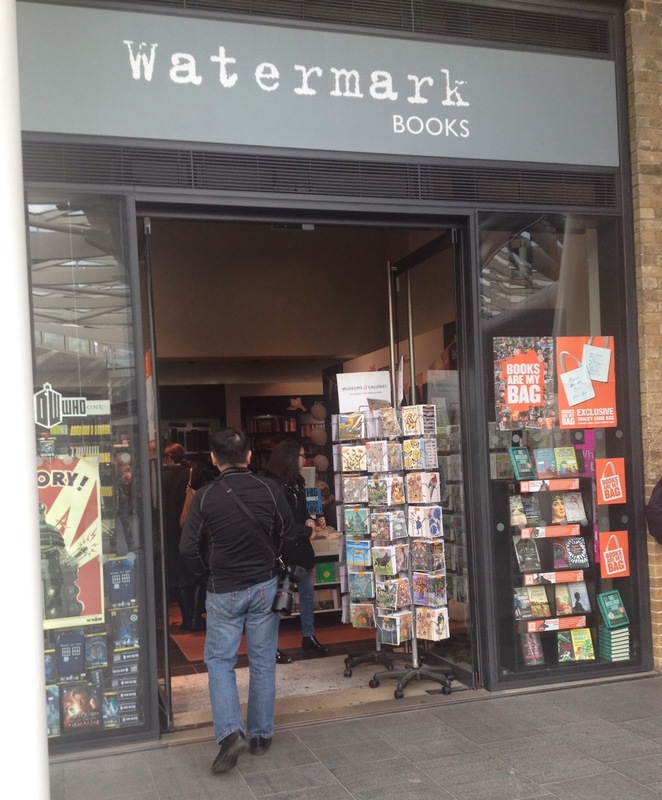 Watermark Books in Kings Cross was the first bookshop party I actually managed to get to on the day. Here I found a whole host of authors hanging out and a selection of cakes and bubbly too. It was great to see so many customers engaging with the various wordsmiths and I got to meet crime writer Jake Arnott as he chatted to a friendly bookseller. I first came here on last year's bookshop crawl and have revisited several times since, so I hope they'll forgive me that on this occasion I only bought a greeting card. 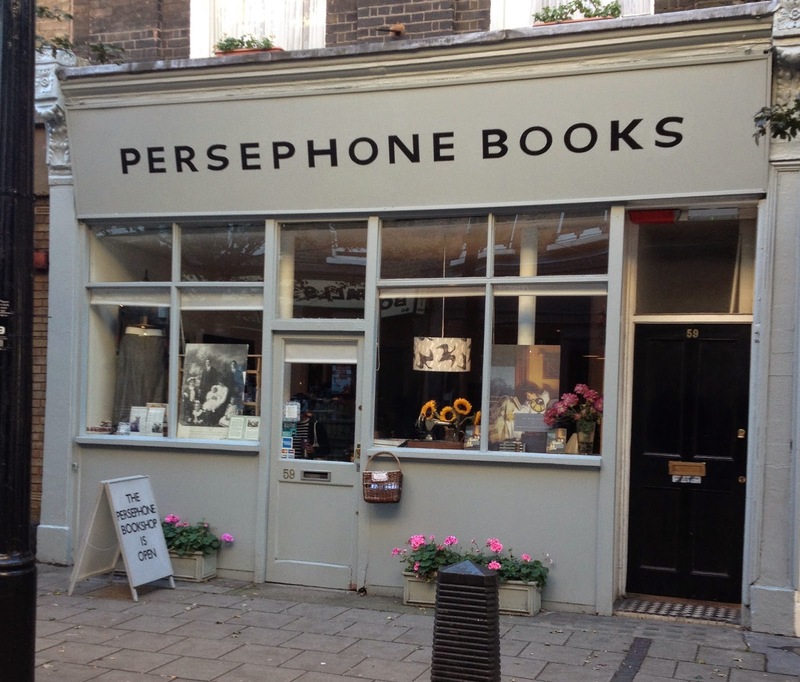 The understated Persephone Books was my 11 and I confess I cheated on my way here, hopping into a taxi to give my feet a rest and save time. Jumping out of the cab and entering a pedestrian zone, the light grey of this bookshop immediately caught my eye as it mimicked the simplicity of the covers it houses. Two lines introducing Frances Hodgeson Burnett's The Making of a Marchioness captured my imagination here. 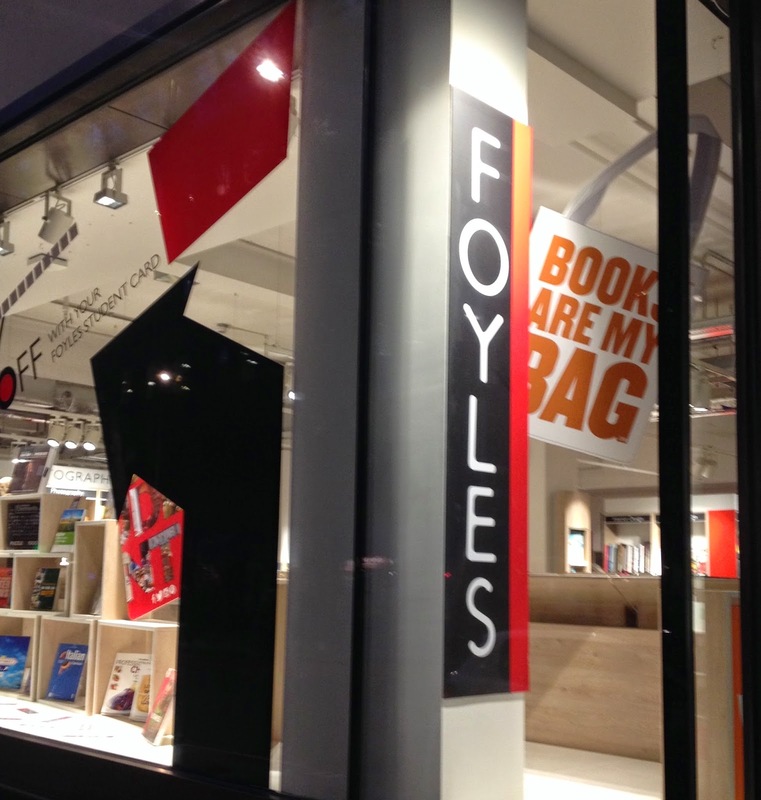 My final destination was also the place where I completed last year's bookshop crawl: Foyles on Charing Cross Road. Lack of time last year meant I only managed a glass of wine in Ray's Jazz Cafe upstairs, so this time I made sure to explore every floor of its new flagship store before pausing for a bowl of stew for dinner (and lunch). Even after a long day – and already overloaded with book purchases – I felt like a kid in a sweetshop. Getting my hands on Julio Cortazar's Hopscotch was the icing on the cake of an epic day. This post is only a very small glimpse of the many varied and wonderful bookshops I met on my Saturday bookshop crawl and I must apologise if it appears list-like at times. All I ask is that you return over the coming weeks to find out more about each of my destinations. They're all independent and individual, and I can't wait to tell you about them. I've already told you about my first love, the place that opened my eyes to the joys of bookshops, now it's time to write about my second. 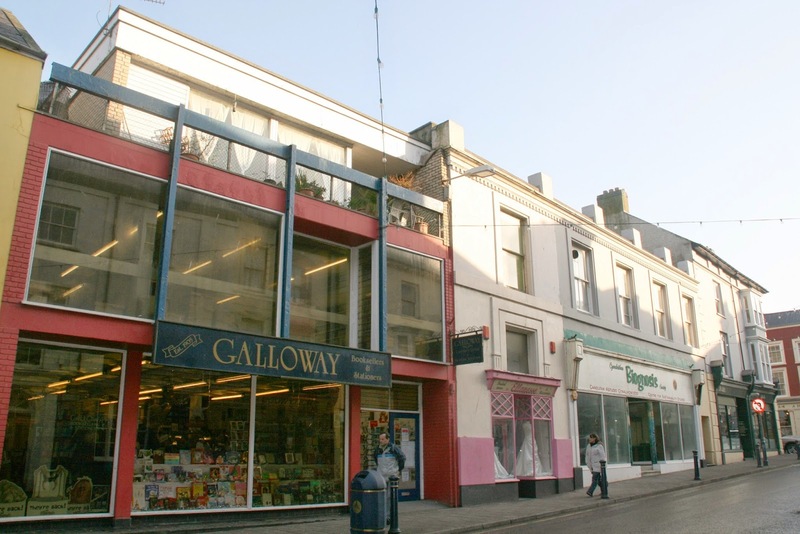 Galloway's (RIP), close to the seafront in Aberystwyth, west Wales, was the bookshop where I first came to appreciate the full extent of the independent offering and the benefits of getting to know your local bookseller. 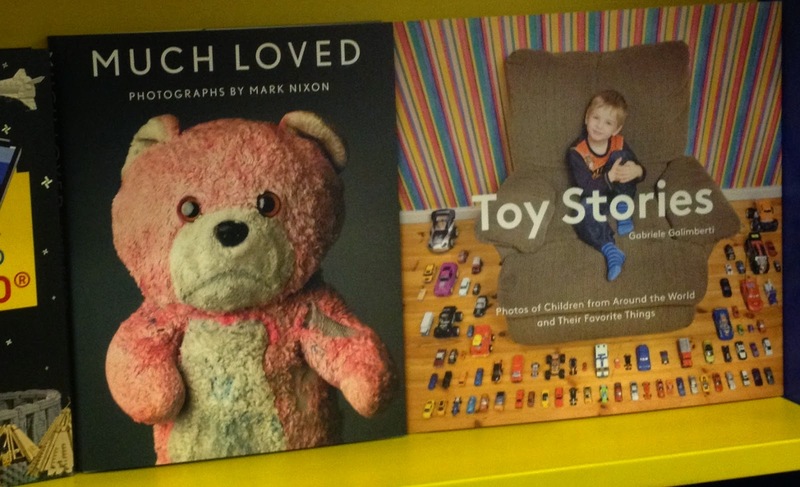 And the reason I realised exactly how great booksellers can be is because a girl met a boy. I wasn't that girl, but she is a good friend. And after they'd hit it off following a very random encounter my friend kindly volunteered to go and buy a book for me from our local indie, where the boy – affectionately known as the Galloway's Guy – could often be spotted manning the till. Obviously the girl's volunteering was entirely selfless and had nothing to do with wanting to see the boy again. Maybe. I have no idea how the conversation at the till went, or what he thought of her choice of book (I do know she admitted it was for me), but more than ten years later they're still happily married, so I consider it a pretty successful bookshopping trip. And the book? 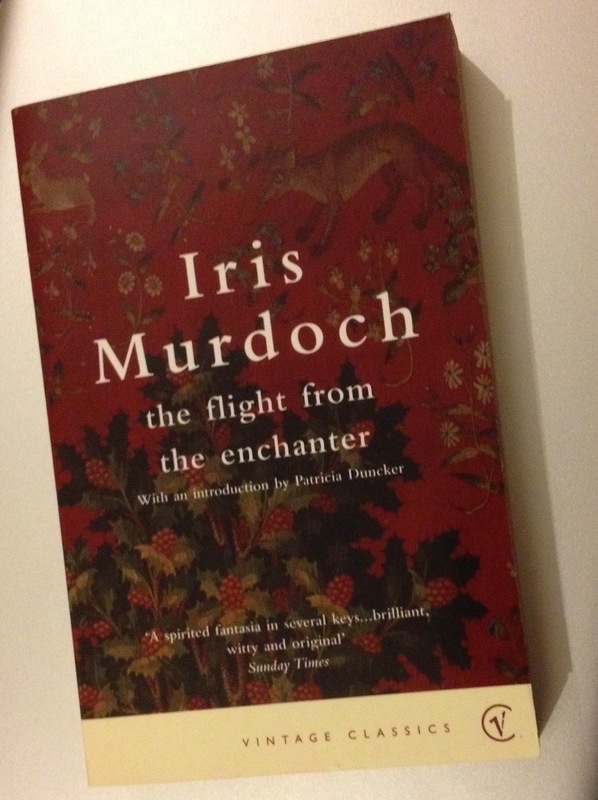 The flight from the enchanter, by Iris Murdoch. At the time a very new to me author, I'd fallen in love with her writing and would randomly pop into the bookshop to buy another of her works whenever my first salary would allow. However as this was only my second ever bookshop I was still pretty nervous about making conversation with a bookseller, which meant I was very grateful to my friend for happening to start to date one, giving me the confidence to talk to him too. And as their relationship blossomed, there I was (probably being a bit of a pest) quizzing him about books and raving about my new love of Iris Murdoch. Whether it was to shut me up, win points with the girl or simply because he was a dedicated bookseller I couldn't say, but at some point in our conversation the boy pointed out that instead of waiting for all of Iris' works to flow through the shop I could instead ask the bookshop to order them all and then buy a book at a time whenever my funds would allow. When the manager later confirmed this I was over the moon. I still remember the first time I walked up to the back of the shop and looked through the hatch where customer orders were kept. There on the shelf was the near complete works of Iris Murdoch (as mentioned, I already owned a few), just waiting for me to buy them when the limited funds of my first ever salary would allow. As a young 20-something I'm sure I shouldn't've been quite so excited as I was, but having previously tried to buy a different – less prolific – author's works only for the publisher to redesign the covers half way through I couldn't help but bounce with delight. Galloway's sadly closed a few years ago, but the bright, open shop spanning three floors lives on in many memories, the friendly booksellers often cross my path and my Iris Murdoch collection still has pride of place on my shelves. Like most people, I have agonising moments of failure. That time when you think "I could've tried harder" or "why didn't I do better?" This is how I feel when I remember my visit to Nantwich Bookshop. I'd set off on a drive north with a long list of bookshops to visit on the way to stay with friends, but bad traffic on the M25, followed by worse on the M1 and M6, meant I gradually had to draw a line through every destination as I wasted valuable bookshopping time sat in a stationary car. Eventually, I left the motorway in frustration at a random junction, thinking I'd skip a stretch of traffic jam by navigating the backroads. Instead I got lost, ending up in Nantwich, a place that meant absolutely nothing to me. Until I remembered I'd seen the name on Twitter. Stopping in the first car park I came across, I walked to the nearby high street, which conveniently opened up right next to Nantwich Bookshop. So relieved was I to stumble upon a bookshop by chance, I didn't engage my brain enough to consider turning up at 4.55pm on a Saturday – having spent approximately seven hours in traffic jams – wasn't the best of times or states to arrive. I practically ran in, using up what was left of my energy in my excitement at finding the place so that by the time I actually stepped in front of a bookshelf of new fiction I was an exhausted, incomprehensible mess. I stood, looking at the colourful spines, barely able to focus on the words in front of me but desperate to make the most of my surroundings. A friendly bookseller came over to say hi and tried to help but, still focussed on the road, I struggled to make the most of her knowledge. She politely gave me some space, realising that for the moment I needed some time to reorder my brain. Having failed so spectacularly to make conversation I decided to explore this large bookshop, which was when I realised how badly I'd failed in my time of arrival. Making my way upstairs I found a (closed for the day) stunning cafe, with beautiful period features, sunlight flooding through the windows and the remainder of the day's cakes not yet cleared from their stands. All next to a broad selection of secondhand books. At that moment I'd've liked nothing more than to sit at a table with tea and cake and forget about the road with my book. 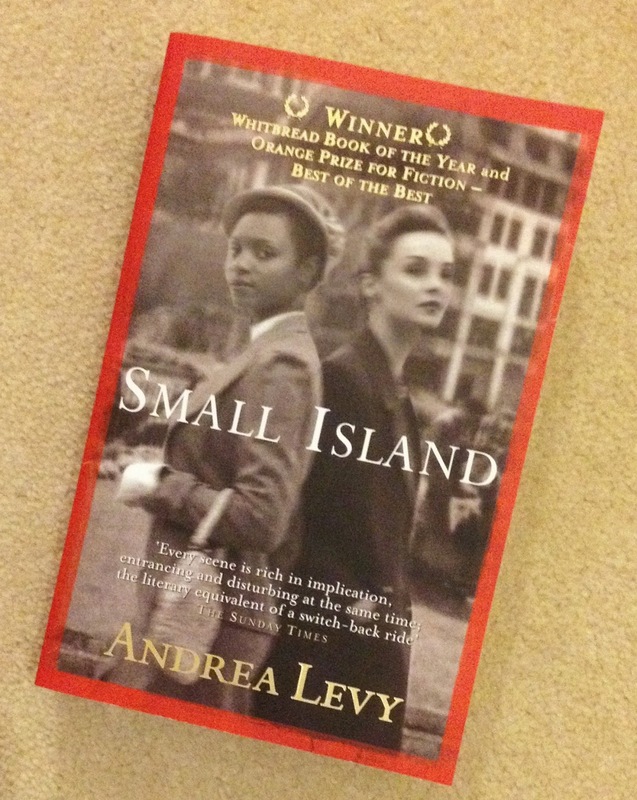 Returning downstairs I selected my purchase, Small Island by Andrea Levy - one of the titles recommended to me during the earlier attempt at conversation, and headed to the till. Thankfully, the bookseller didn't hold my previous vacant expression against me, and having become myself again during my exploration I was able to talk about the bookshop properly. 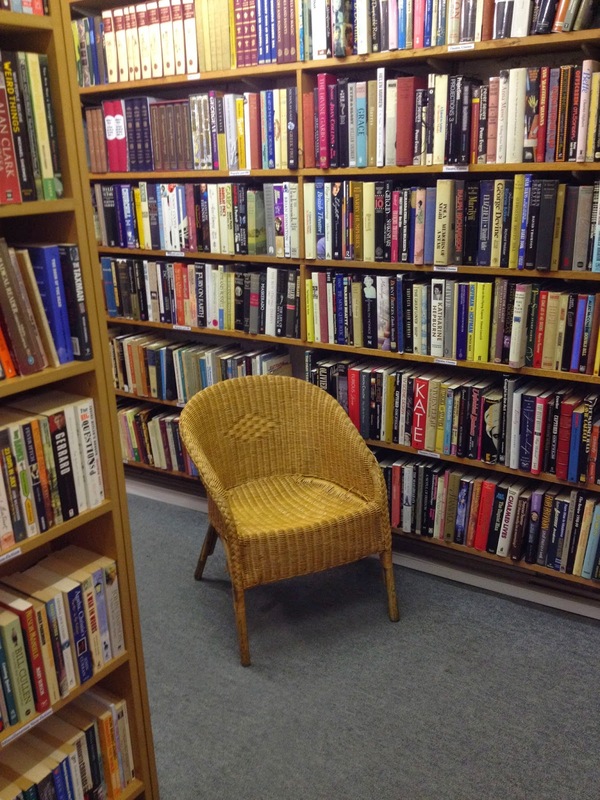 As is a common story for independent bookshops, times have not always been good for Nantwich Bookshop, but diversifying to include the coffee shop and events such as their regular supper clubs – with a menu that made me particularly hungry – appear to have made a big difference to this lovely bookshop's fortunes. Which is good for local bookshoppers and good for me – because I know it'll still be around when I make a return visit. And next time I'm determined I'll arrive early enough to experience and appreciate it all.